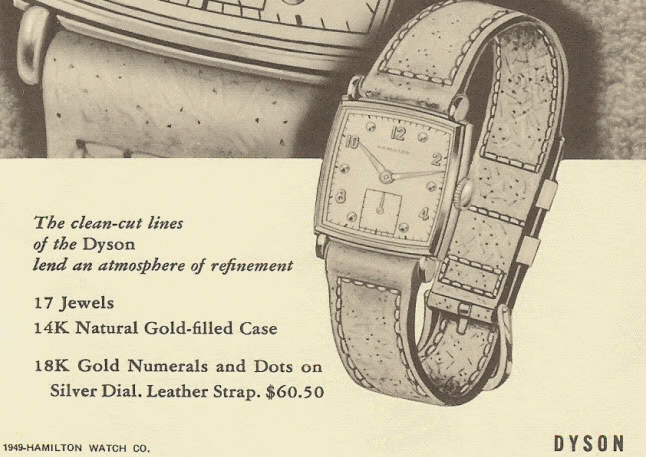 The 1948 Hamilton Dyson is a surprisingly common watch. It was produced for four years and Hamilton must have sold a gazillion of them based on how frequently you see them for sale. 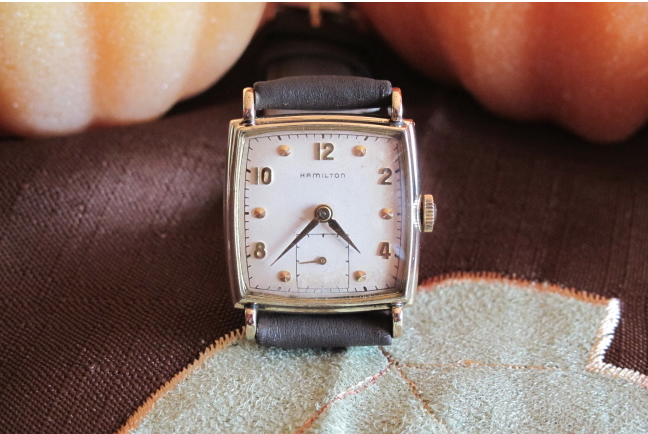 Behind the white finished sterling silver dial is a 17 jewel 8/0 sized 747 movement. The case is 14k yellow gold filled and the tops of the lugs are prone to wear through. I've had the opportunity to restore several Dysons - as when they're in poor shape they tend to be very inexpensive. If I recall correctly, I purchased the project watch below for about $25. After cleaning the dial, overhauling the movement and installing a new glass crystal and leather strap, this Dyson was ready for wrist time. Just curious. When you cleaned the dial, what did you have to do with the gold markers? Lift them out or just clean around them? Cleaning dials is tricky business. I don't suggest doing it unless you're willing to get the dial refinished. Some people are real partial to original dials... even poor condition ones. For me, I don't want the dial to be a distraction from the watch so I prefer refinished over a poor condition dial. 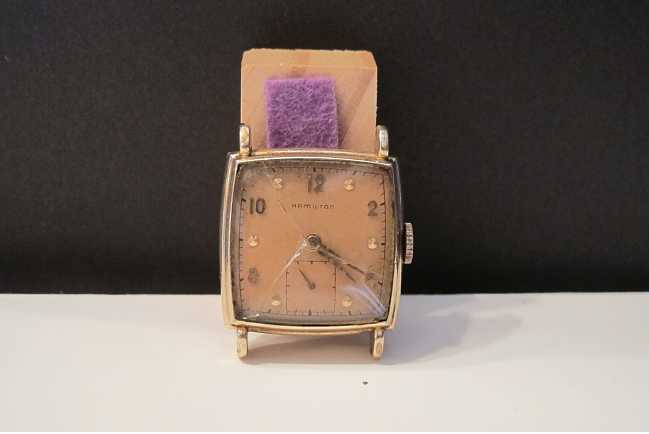 Anyway - in order to clean a dial it must be removed from the watch. That means pulling the hands off the watch and loosening the dial feet screws on the side of the movement. Then I dip the dial in an ultrasonic jewelry cleaner, let it soak, rinse it in cold water, then repeat until I like the results. You have to know when to stop as cleaning too much will lighten or remove the printing and require getting the dial redone. You don't want to try to remove the markers or numerals... they are actually riveted on and getting them to stick back on would be an unnecessary challenge. Is there someone you recommend for dial refinishing? International Dial does good work when they have the correct dial pattern. Eagle Dial also does good work with the same caveat. I purchased this watch for my dad, actually looks almost exactly like your photo! He loves it so much but it needs a new band. He measured 5/8" which should be 15mm, but is this 18mm? Thank you! 5/8" is correct. Get a 16mm, it is easier to find than 15 and will be a better fit.